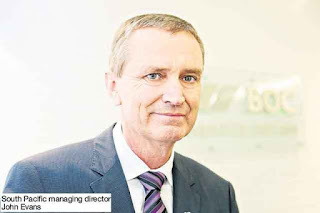 THE British Oxygen Company has invested more than K135 million as it has confidence in the business environment in the country, says South Pacific managing director John Evans, pictured. The company set up its factory in Lae’s Mangola Street in 1967. However, a fire burnt down its offices and warehouse in 2012. It has now rebuilt its gas and gear facility to provide affordable services to industries in Lae and the country. Evans said the company had two fundamental principles – safety and people – which strengthened its aspirations to serve the needs of customers in various sectors. Evans said it was the leading gas and engineering company in Papua New Guinea supplying compressed and bulk gases, chemicals and equipment to customers in the mining, oil and gas, industrial, health, hotels and hospitality businesses, refrigeration and agriculture industries. “I believe in the economy of the country, the people and our products. And we are confident in our investments for continuous growth into the future,” Evans said. Evans said rebuilding the facility involved a lot of hard work. It was commissioned by Pastor John Garu.